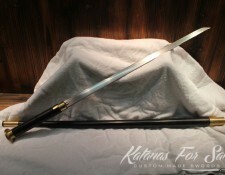 A hidden blade-release mechanism ensures a speedy deployment of the sword cane blade in times it is needed. Our sword canes are made of high carbon steel and feature a double edged blade for a maximum cutting edge. 1060 carbon steel which goes through folding process creating thousands of layers and beautiful Damascus pattern on the sword. 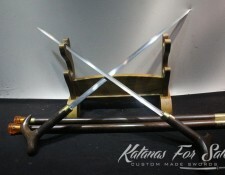 Browse through our handmade tactical sword canes for sale, if you are interested in a custom one made for your size, please contact us with more information.